Exterior Treatment Service: Exterior application for stinging insects (wasps, hornets, carpenter bees, yellow jackets) performed in the spring with a service agreement until the end of December. 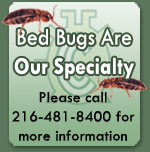 For wood roaches, cluster flies, this service would be performed in the spring and fall. Any problems encountered are serviced at no charge. Flea Pre-Treatment: Performed on the interior of the house in March, will prevent flea infestations through December. Any problems encountered are serviced at no charge.